The Curlew National Grassland provides a diversity of activities different from forested lands. The grasslands are administered as multiple use lands with emphasis on grazing of livestock, watershed management, wildlife, and recreation use. Of special interest is the Sweeten Pond area developed especially for waterfowl and shorebirds. 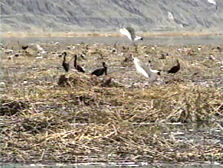 Many bird-watchers visit the area in the spring to watch the Sharptail and Sage Grouse perform their courtship dances. Stone Reservoir is a popular area for boating, waterskiing, and fishing for bass, crappie and rainbow trout.